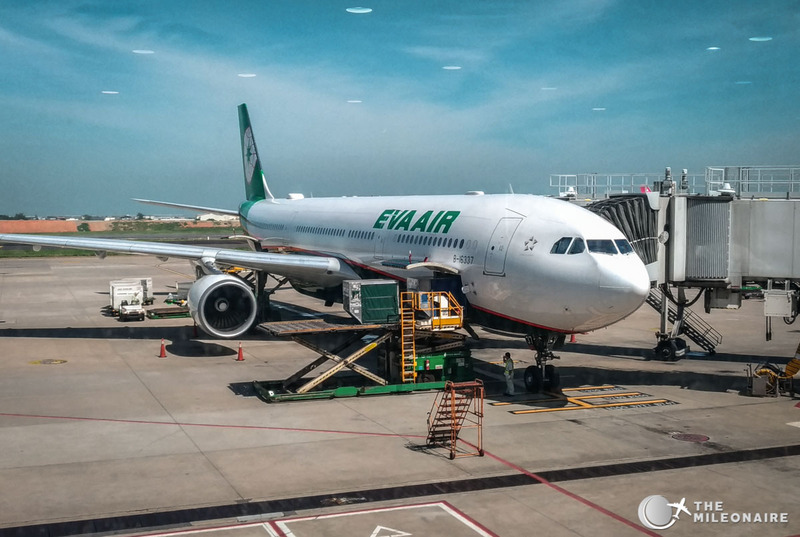 After I’ve tried the Royal Laurel Class on my way from Bangkok to Taipei already, it was time for ‘the other’ EVA Air Business Class on the next flight: a wonderful Airbus A330 was waiting for me at the gate with the ‘old’ EVA Air Premium Laurel Class. The EVA Air Premium Laurel Class in the A330 is often used as a regional Business Class for Asian routes, but also serves some EU/US destinations. It’s quite a steal when booking with miles, but is the Premium Laurel Class worth the price? Let’s find out! After a once again well-organized boarding process (as always with EVA Air) you enter the plane via the business class finger, where flight attendants guide you to your seat. 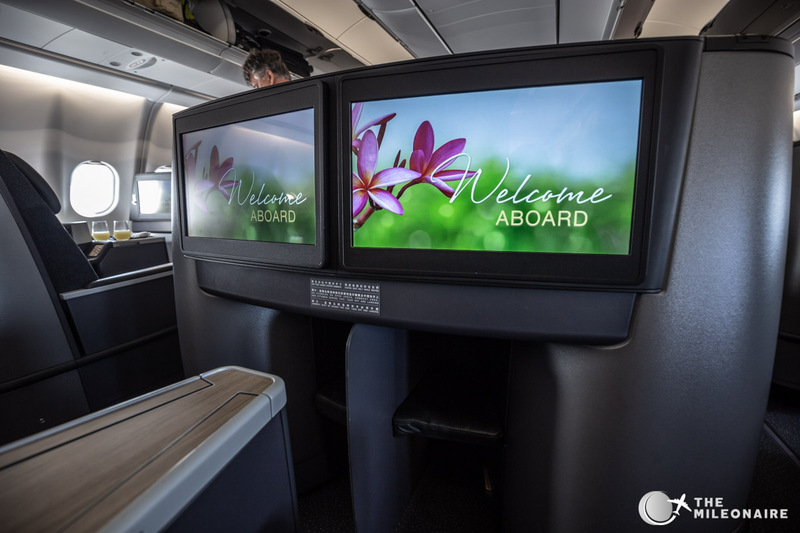 The biggest difference between the Royal Laurel Class and the Premium Laurel Class is super obvious from the start: the Premium Laurel Class is arranged in a 2-2-2 configuration instead of the 1-2-1 configuration used in the Boeing 777s – strange, because 777s are the wider airplanes. Sadly your level of privacy in the Premium Laurel Class is worse than in its counterpart, as you’ll always have someone next to you – without any additional dividers between you and your fellow co-passengers. Another big difference: not every seat has direct aisle access, so you need to crawl over someone else’s legs when you need to go the bathroom. 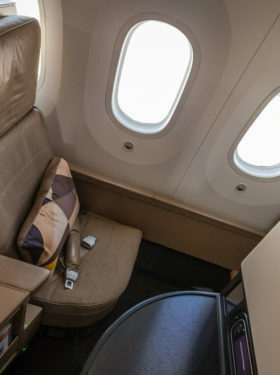 The cabin reminds me of Lufthansa’s Business Class with its 2-2-2 configuration and all of its drawbacks. 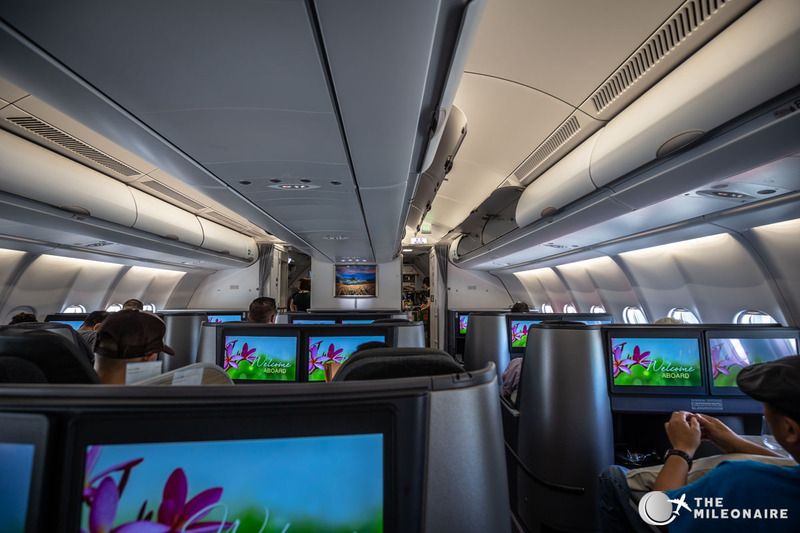 Despite these negative issues, the design of the cabin is nice: the seats are in gun metal grey, and in combination with some light grey tones the overall look is sleek. 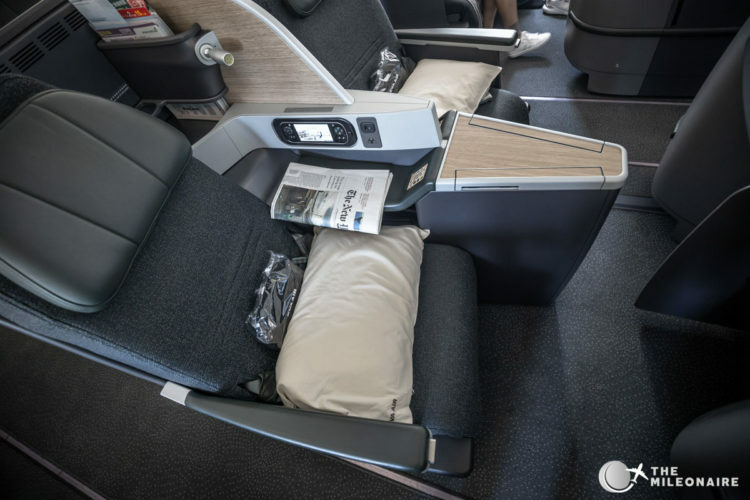 Even though the configuration f the EVA Air Premium Laurel Class looks outdated, the seat itself seemed to be pretty new: there was no wear or tear, and everything looked quite inviting. The seat in the Premium Laurel Class is not a lie-flat seat, so you will never get a ‘full bed experience’ here. The headrest consists of a pretty large leather cushion, and there’s another pillow waiting for you at the seat. As I mentioned before, the level of privacy is definitely not ideal; you always have someone next to you, and there is no real divider in between the seats. While this is awesome for couples, solo travellers might get annoyed at some point. If you’re travelling alone, you should definitely get one of the middle seats (D or G): that way you won’t have someone else climbing over you, as every middle seat has aisle access. At the side you’ll find a small handheld to control the inflight entertainment system, similar to the Royal Laurel Class. There’s also a USB slot (no regular power outlet), and the control panel to adjust your seat. Behind that is a reading light and another storage space for magazines. Directly in front of you is the screen, as well as a pretty narrow foot rest. 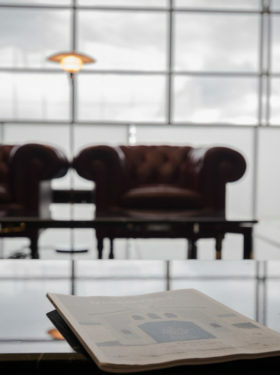 Even though the seat is quite comfortable, it doesn’t reach the level of the Royal Laurel Class. 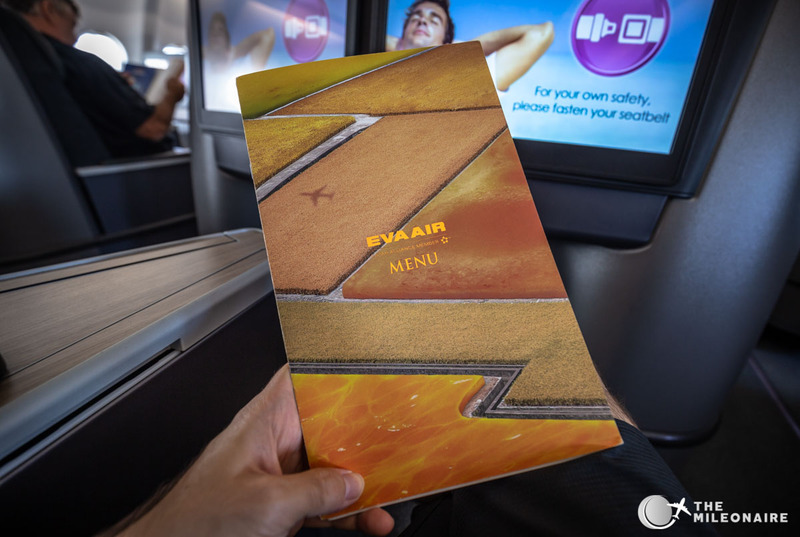 I also received the menu for today’s flight, with different options for each the appetizer and the main dish. There were no amenity kits though. The drink menu was really good: champagne, various good wines, cocktails, various coffee specialties and softdrinks. After that the lunch service started, so guests would have the most time to relax before landing. I chose the salmon as my appetizer, accompanied by the always excellent garlic bread. 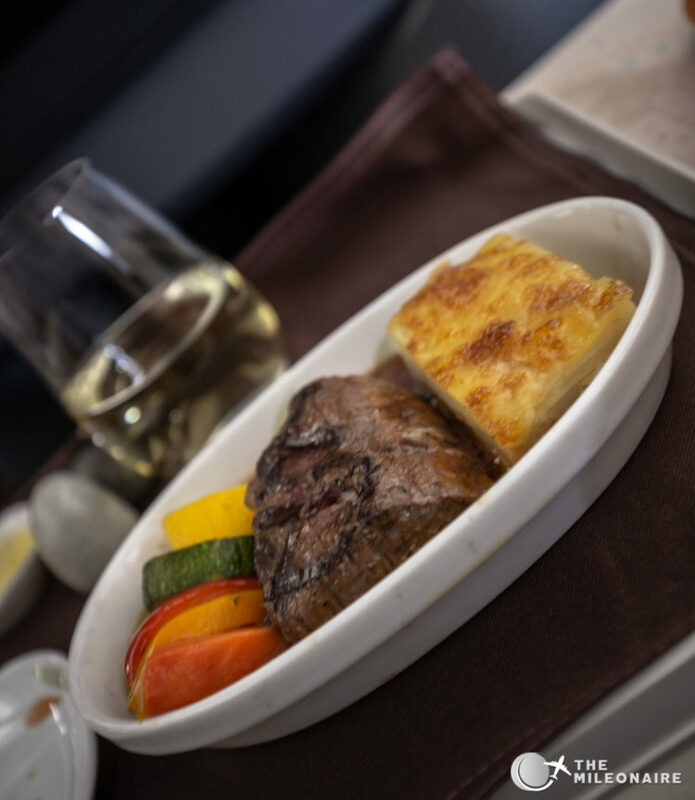 As my main I chose the beef filet, although that’s always risky on a plane. To my surprise it was still available. Also to my surprise: it was really good, well done but still tender. I didn’t like the presentation though, and that’s something that EVA Air does in all business classes. When you have such an awesome piece of meat, why do you just put it into a porcelain bowl with everything else? 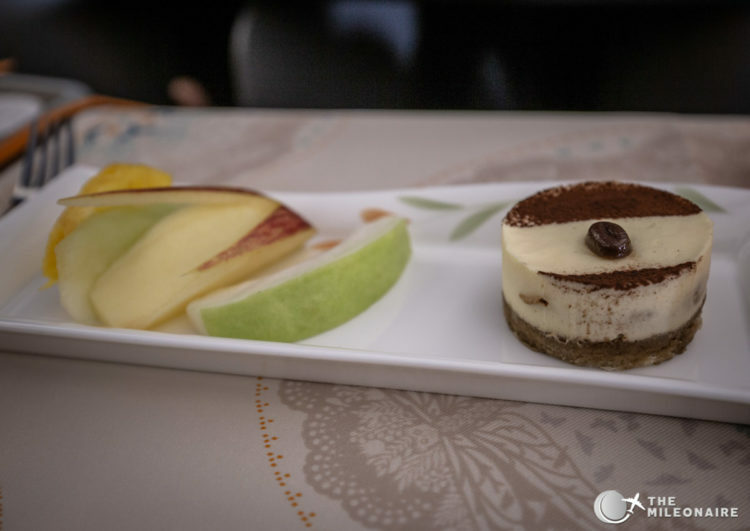 This is one of the areas where EVA Air could improve a lot, just by adding a bit of creativity to their meals. Maybe I was spoiled by the Oman Air Business Class on the flight before though. I then relaxed for the rest of the flight with the solid inflight entertainment system. The selection of movies and series is solid, but can’t compete with the best in the industry (like e.g. 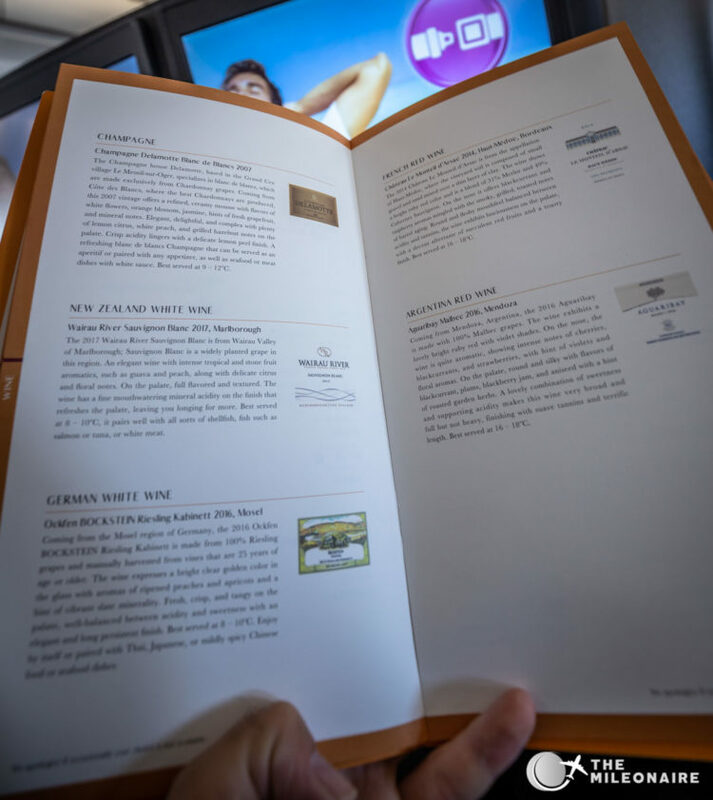 the one in Air New Zealand’s Business Class). All the time during the flight you can call the cabin staff to get a snack or another drink, but I was fine. After five hours our A330 landed in Denpasar, and a good flight in EVA Air’s Premium Laurel Class came to an end. 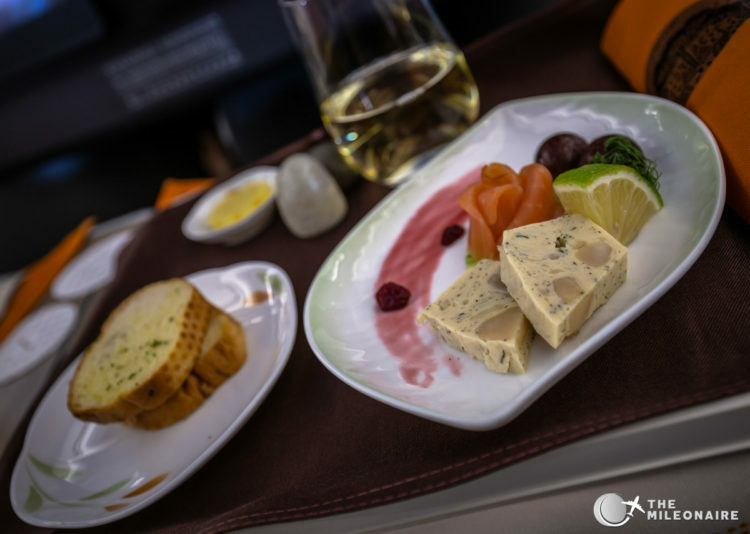 While the EVA Air Royal Laurel Class offers a fantastic 5 star product, the Premium Laurel Class sadly lags behind a little. 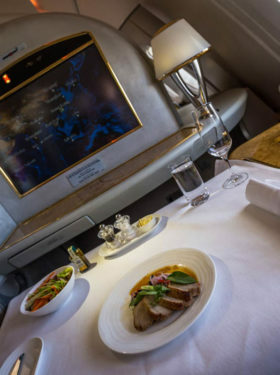 Service and catering (minus the presentation) are top-notch, the seat sadly isn’t. Just to make myself clear: the Premium Laurel Class can still compete with tons of business classes in the world (e.g. 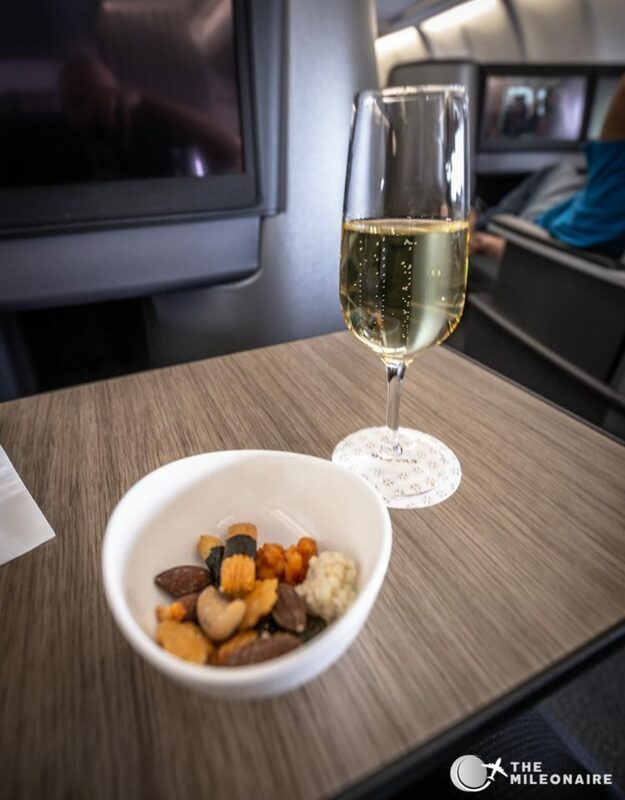 the one that Lufthansa offers), but the difference to EVA Air’s ‘other’ business class product is just too big – so it’s always a gamble which one you will actually fly with. 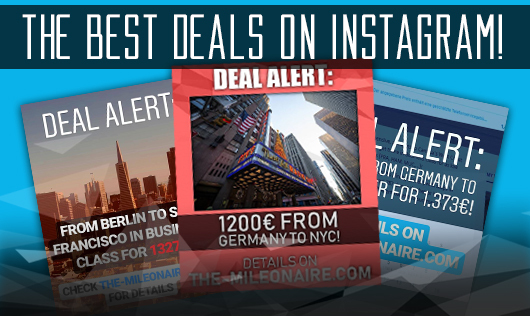 To be on the safe side, check Flightradar (or similar) that a Boeing 777 flies the route you’re booking.